You are here: Home / 10th at WGP Houston, Part Two. And the FUTURE! Hey everyone! I’m back for the exciting continuation of my previous article, found here. I intend to make the wrap-up of my tournament a bit shorter than originally planned. But don’t fret! The reason I’ve made such a rash decision, is so that we can talk about some of the AWESOME NEW SPOILERS. Yes, yes, let as SOON as I’m done recapping, you get to hear some of my wondrous musings on some of the brand new cards due out in Seven Kings of the Land (SKL for future reference). Alright, well I had just taken my first loss in round five of nine. This likely meant another loss would end my contention for top eight. And here we goooooooo. Going first is obviously great in any pseudo-mirror match. My opponent quickly reveals to me that he is playing dark as well as fire stones. This means I have to be extra careful to not get blown out by Flame of Outer World. After having trouble trying to find a Laevateinn, the turn Joshua starts to get aggressive with Cain, I end up locating one, taking out his J Ruler without losing mine, and start taking over the game from there. Game three. I have a great hand with double Laevateinn, Rukh Egg, Thunder, Cthuga. I almost decide to YOLO and flip with no stones on turn one, getting in for 2000 damage. Something inside me says, “DON’T!” So I don’t, wait until turn two, then flip after getting one stone in to play. After getting Josh down to 1700, him also being on one stone, Josh decides he has to flip and use Bloody Snow White to keep my Bahamut tapped down. It’s at this point I thank my brain for telling me not to J-Activate on the first turn with no stones in play, I would have been completely locked out of the game! We have a strange dance of trying to find things to do with only one stone, trading Hunters, Cthugas and Thunders until I eventually get him down to zero. Both our games are pretty one-sided. Going first is great, yada, yada. Unfortunately, in game two Mike had to mulligan all five of his starting cards. This is one of the rare times that the mulligan rule can fail. Having not a single card that’s worth keeping sometimes happens, and sometimes your top ten cards can be pretty lackluster. After Mike got 300 in with a Hunter, I was able to drop a Hunter with a Bullet of Envy and crack back for 1100, banish my now useless Bulleted Hunter to murder his, then get in for another 1200 with my Bahamut. Hopefully it was quick enough to be painless. Alright, almost there, two more to go! 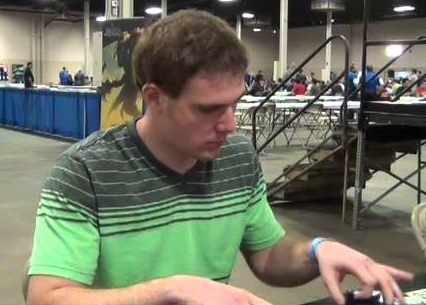 Antyn was probably the most “with it” player I faced during the Houston WGP. Before going further, I’d just like to take this moment to congratulate Antyn on making the US National Team! Very nice achievement man, best of luck in Japan. Our first two games are the usual struggle of starting behind and trying to catch up but coming up just short. In the third game, Antyn is going first of course, and I find a window. A window where I might be able to crack the curse of going second and have a chance to catch up and possible come out ahead while on the draw versus a competent opponent. Unfortunately for me, I looked at that window for so long, it ended up shutting on me. The line of play that I took played right into a Susanowo that I knew Antyn had because of a reveal from the Rukh Egg he had banished earlier. But I had tanked for so long on my available plays that I just had to make a decision and chose poorly. On my board was a lone Rukh Egg, and in my hand Crime and Punishment, Cthuga, Bullet of Envy, and Duel of Truth. Had I Called a third stone, I would have been able to summon Cthuga, banishing the Egg, added the Bullet of Envy, attacking Antyn’s Melgis, causing him to return to ruler form. Then during Antyn’s turn, depending on how he chose to play it, I would have been able to catch him off guard with either the Duel or the Crime and possible out tempo him just enough to get back in the game. Antyn had multiple Regalia, which meant he could still fight through my Duel and effectively three-for-zero me. But it was certainly a better line than J-Activating my Bahamut in the face of a Susanowo. AND, it has the added bonus of being a blow out if Antyn doesn’t play cautiously. But just like that, my run at the top 8 and dreams of flying to Japan were crushed. With so many choices and such little time to evaluate all my options sufficiently I had fallen. No offense towards Brady here, but I really don’t know how his deck defeated all of his previous six opponents. It was mono-light Faria, and according to my game notes, I ended both games at 4000. Some people were saying that some X-2s were going to make it in. I’ve been to enough tournaments that I knew this was very, very unlikely. Though, in Magic: the Gathering events, intentional draws are allowed, usually happening in the final rounds to ensure people can get into the top 8. So being in a tournament where intentional draws were not allowed, maybe it was possible? Nope, CRUSHED again, not a single X-2 made it, with my tie-breakers somehow granting me a reasonable 10th place. As the event hall started to empty out, Nick Curtis came over to me and asked if I was interested in doing some commentary for the top 8. I figured it could be fun, and I was probably going to watch anyway, so over to the microphones we went! For some reason, the Past Broadcasts for the Houston event are not available, and I haven’t actually been able to locate them anywhere (frowny face). Leave it to say, that if you didn’t tune it, you missed out big time! Nick, Chas Tanner and I had a great time, commenting, complaining about Bahamut, fielding questions about the event, and eventually interviewing Antyn about what it felt like to be heading to Japan to play for the US national team. I’ll certainly would jump at the chance to be able to cover some more competitive Force of Will matches in the future (though I’d rather be the one being covered, of course). By the looks of things, competitive Force of Will is ever expanding, which is a great thing. While we don’t quite have a schedule for the next year’s WGP circuit. Instead of just sitting by, idling waiting for those tournaments to start, Alter Reality Games has decided to host a slew of events over the next couple months dubbed the FOW Circuit Series, more information can be found here. It looks very exciting, with invites being given out to a National tournament that can qualify players for next year’s World Championship. As of this writing many of the cards from Force of Will’s latest set SKL have been officially spoiled. Players haven been gleefully spamming the Force of Will US Facebook page with endless pictures of cards they have been mailed. And boy is it nice. By the looks of things, there should be enough tools to give a good scare to Bahamut and his trusty Regalia. Before I leave you for the time being, let’s take a look at a couple of the more potent options. Deathsycthe, the Life Reaper is one of the more obvious choices. Seemingly made to completely negate the effects of Laevateinn. The drawback of the Deathscythe is that, well, it just doesn’t do much else. It would be nice if just the presence of Deathscythe in the format was enough to shoo away Bahamut, but that is unlikely. A very good chance this will be in an abundance of sideboards. Marybell, the Steel Doll is another fairly clear option. Able to destroy any other Regalia just by resting and paying one will of any attribute seems like a fair price to pay. My only complaint here is that you really need to be keeping one will open at all times. Otherwise you open yourself up to them playing their Regalia when you tap out all of your will sources, leaving you vulnerable. Marybell’s other two abilities are also much more appealing than the Deathscythe. Being able to save your J-Ruler 200 damage at a time is great, since the only way to regularly destroy J-Rulers is through damage. And finally, when there are no more Regalias to destroy, feel free to turn in to a 1000/1000 and start thrashing your opponent. Blazer Gill Rabus is, at first glance, a seemingly great option at dealing with Bahamut (or any ruler really). However, if a savvy opponent knows that they can let Blazer’s “lose all abilities” trigger resolve AND THEN add Imperishable to their J-Ruler, say by banishing their Laevateinn, then Blazer here becomes sort of lackluster. Also, once they see you are using Blazer, they can choose to not J-Activate until they can get a good deal of value out of doing so. Lastly, Blazer can only J-Activate after the opponent, meaning that if Laevateinn is involved it is likely that a great deal of damage has already been done. Those are the only cards I’ll be talking about for now! They seem like the most obvious ways that the Bahamut Beast will be curtailed. Next time, I expect to write about some of the cool new synergies, hopefully involving the resurgence of slow, grindy control decks. Though with the extinction of the Enter keyword, I doubt my home boy Abdul will ever see the light of day again.